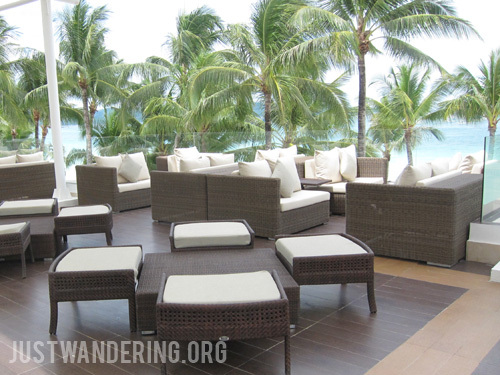 The District Boracay has three food and beverage outlets: the Vigan Grill, Star Lounge, and Caruso Ristorante Italiano. My first meal at The District was at Vigan Grill on the day of my arrival, and I was joined by the Ms. Naomi, the Resort Manager. As we wait for the food to arrive, we shared stories of travel and visa frustrations. When my order of grilled prawns and poqui-poqui arrived, I ask why the restaurant is named Vigan Grill. Turns out that the owners of the hotel are from Vigan, and wanted a taste of their home available in the island. 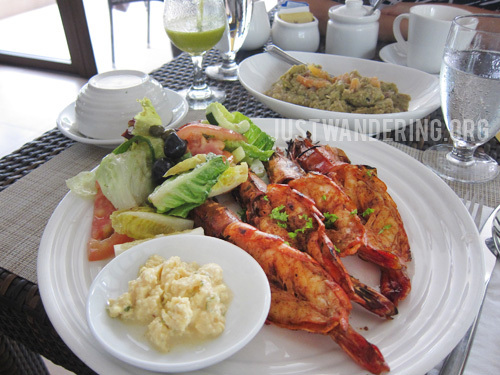 I have to say, it’s a very welcome treat, specially if you’re looking for something different to eat in Boracay. This is also where the buffet breakfast is served. Ms. Naomi tells me that she and the chef discuss the buffet spread everyday, changing it based on the following day’s occupancy: if there are Westerners checked in, more breads, salads and cold cuts are added; noodles and congee are present if there are guest from East Asia; more meat if there are Filipinos. 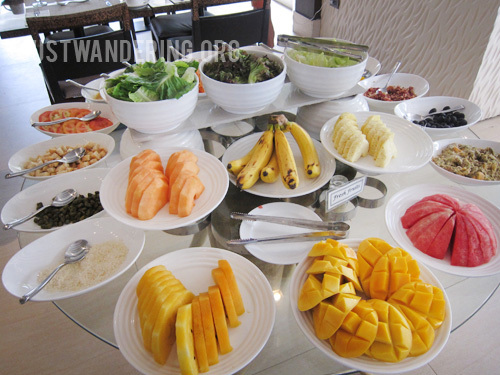 It was a pretty good spread for a small space, with plenty of variety to match every diet, mood, and craving. However, if you’re staying for more than one night, you might find very little difference from what was served during your first morning. As the sun inch closer to the horizon, Star Lounge opens its door. This is their rooftop bar and restaurant, where you can chill and watch the Boracay crowds below. You can order cocktails and ala carte menu items from Vigan Grill, or go for the dinner buffet of grilled meat or seafood. Caruso Ristorante Italiano is located right at the beachfront. Beachside dining is only available in the evenings, but during the day you can try Caruso’s amazing menu inside Caffe Caruso. 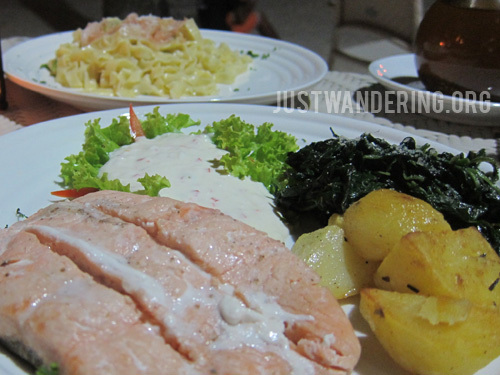 We ordered a pizza, baked salmon, homemade pasta and chocolate mousse, and everything was fantastic. 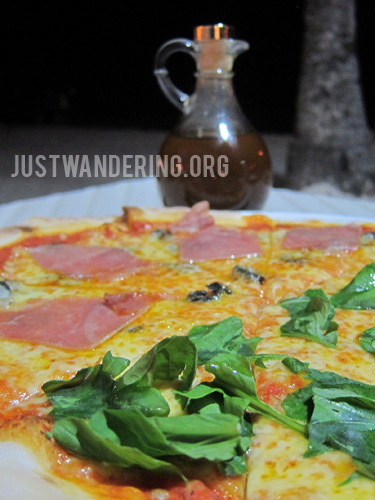 It’s unlike any Italian food I’ve tried in the Philippines. The pizza and pasta were simple: only the freshest and best ingredients used, and not loaded with unnecessary ingredients. And the salmon? Perfection. We were joined by Mr. Dario, the restaurant’s owner as we were having our dessert. It was then we found out that the Boracay is just a branch of the original restaurant in Makati. I’ve tried the restaurant in Makati and the quality of the food is the same. All in all, it was a great three days of eating and relaxing at The District. Much love goes out to Ms. Naomi, Mr. Dario, Vina, Apple, and all The District staff who made this stay memorable! I love eating prawns. And these prawns are really big. Now i’m craving for one. I wonder how these tastes like. It really looks delicious.Very well presented. Good job! 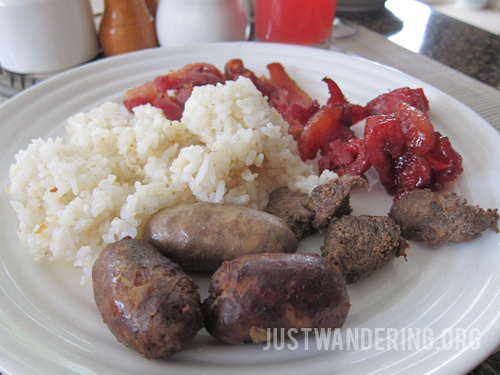 One thing that I really miss in Boracay aside from the beautiful islands and beaches is the food. I love Filipino dishes… Yummy.. Winner of the Tiger Airways ticket!